The book 'Come On! 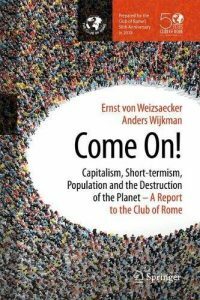 Capitalism, Short-termism, Population and the Destruction of the Planet - A Report to the Cub of Rome' is a read that we encourage for everyone. Pope Francis recently said: "Our common home is in deadly danger". The Club of Rome's warnings published in Limits to Growth are still valid - current worldwide trends are not sustainable. We are stuck in our cognitive dissonance, and a greater philosophical crisis - very much aligned to our broken value system. This book analyses this philosophical crisis and comes up with the conclusion that we need a new enlightenment. An enlightenment that is not solely based on doctrine (a.k.a. a false belief system), but instead addresses a balance between humans and nature (we are part of nature), as well as a balance between markets and the state, and the short and the long-term. To do this, we need to leave behind working in "silos" (e.g. ecologists over here, economists over there) in favor of a more systemic approach that will require us to rethink the organisation of science and education. Its last chapter focuses on education and sustainability. The bottom line is though, that we have to act NOW. The world cannot wait for almost 8 billion people to reach their enlightenment. This book is an optimistic yet urgent presentation of the change that is needed before it is too late. You can find the book here.